The Board of Directors of the Campbell River Harbour Authority (CRHA) clearly exemplify how easy it is to defraud the general public and the membership of a Not-for-profit Corporation of money and services to the betterment of themselves. Capt. E. Gerardo da Costa Duarte, acknowledges that his ignorance of corporate facts involving the Campbell River Harbour Authority (CRHA), at the onset of his arrival in Campbell River, British Columbia, Canada, sometime during the spring months of 2008, prevented his detection of fraudulent practices. Yet, the blunt disregard for maritime practices involving oil pollution control and unseaworthy vessels plying the CRHA facility, prompted Capt. E. Gerardo da Costa Duarte to inquire as to the governance and law enforcement applied to everyday running of the CRHA facility. From 2008 to the end of 2009 any verbal inquiry, originating from Capt. E. Gerardo da Costa Duarte, directed at CRHA staff and/or CRHA Board Members; as to the type of organization the Campbell River Harbour Authority fell under, the answer was definitive, indicating that the CRHA facility was part of Small Craft Harbours under the control of Fisheries and Oceans Canada (DFO). Reflective of a state of constant conflict since Capt. E. Gerardo da Costa Duarte, requested to review the finances of the Campbell River Harbour Authority, initiated sometime in January 2009, it became obvious that the Board of Directors of the Campbell River Harbour Authority were part of criminal activity to defraud the Harbour Users, the CRHA Corporation and the CRHA membership, of monies and services. Specifically, when all the rights and privileges of Capt. E. Gerardo da Costa Duarte, as a member of the CRHA Corporation, were illegally removed; the right to vote, the right to review the CRHA finances, the right to address issues of concern before the membership seeking a resolution and the right to enjoy a facility paid by Taxpayers for the usage of taxpayers. Furthermore, corporate fraud was exemplified by CRHA directors and staff, misappropriating corporate assets, providing incorrect and/or misleading information to the CRHA membership, specific to a lack of financial accountability and resorting to physically assaulting Capt. E. Gerardo da Costa Duarte while he was taking a picture of an unseaworthy vessel sinking within the CRHA facility. While the attitude of physical assault is of a grave criminal concern, it is a common occurrence at the CRHA facility, where Sail Master Manfred Binger was also threatened with physical harm by CRHA Directors for questioning the CRHA finances. The persistence of Sail Master Manfred Binger and Capt. E. Gerardo da Costa Duarte demanding financial accountability and transparency from the CRHA Board of Directors, eventually lead to a frivolous and vexatious Federal Court lawsuit (T-1003-10) filed by the CRHA Corporation, under the direction of the said Board of Directors, for unpaid moorage fees that were increased to nearly ten times the normal fee applied to all other Harbour Users. a) To control and operate effectively the Harbour Facilities in the Port of Campbell River formerly operated by the Small Craft Harbours Branch of the Department of Fisheries and Oceans. b) To provide all users of the Campbell River Harbour with safe, effective and environmentally sound harbour facilities including; but not limited to, wharves, seaplane floats, marine docking and cribs, storage and vehicle parking areas and commercial marine business support. c) To regulate harbour use in a safe and fair manner, providing for the effective sharing of harbour resources among all user groups such as commercial fishers, recreational boaters, fishing guide operators, marine and foreshore businesses and visiting vessels. d) To maintain existing facilities and services for users groups. e) To promote the development and long term growth of the Campbell River Harbour, its facilities and the services it offers in a manner for the betterment of its users. f) To operate the Campbell River Harbour in a fiscally responsible and cost effective manner consistent with the leasing of facilities from the Small Crafts Harbours Branch of the Department of Fisheries and Oceans. g) To govern the activities and operations of the Campbell River Harbour in a way that is fully accountable to harbour users and members of the Campbell River Harbour Authority. The Corporation is to carry on its operations with pecuniary gain to its members and any profits or other accretions to the Corporation are to be used in promoting its objects. DATED at the DISTRICT OF CAMPBELL RIVER in the PROVINCE OF BRITISH COLUMBIA, this 5th. day of JUNE, 1997. Since the onset of the CRHA Letters Patent (1997), the Campbell River Harbour Authority is under the authoritarian control of the following directors; Timothy Charles Danby Hobbs, Bruce William Kempling and Hugh Silver. On a secondary capacity, following on the wishes of the preceding Directors, involves CRHA manager Linda Franz, serving the CRHA facility from 1997 to 2009. Since 2009, Linda Franz retired due to illness and Bruce Kempling retired from the Board of Directors in 2010 by not seeking re-election from the tightly controlled CRHA members that show up at every Annual General Meetings. (a). The CRHA Letters Patent, CRHA Corporation By-Laws, DFO Lease Agreement, and Financial details, are never shown to anyone, regardless of the style of request. (b). Any request directed at CRHA staff and/or Board of Directors, to identify the type of Corporation, the answer arrives with firmness that it is a Harbour Authority under the control of DFO, Small Craft Harbours Branch. (c). Any request for a membership list to ascertain membership voting rights, the request is strictly denied. (d). Regardless of numerous motions presented to the tightly controlled CRHA members at Annual General Meetings, not a single motion carried was ever incorporated on the CRHA by-Laws and/or Rules and Regulations. Specifically, an indication that no repealed or amended CRHA by-laws were meant to seek approval from the Minister of Industry as per CRHA By-Law 64. (e). CRHA By-Law 64 states; The by-laws of the Corporation not embodied in the letters patent may be repealed or amended by by-law enacted by a majority of the Directors at a meeting of the Board of Directors and sanctioned by an affirmative vote of at least two-thirds (2/3) of the members at a meeting duly called for the purpose of considering the said by-law, provided that repeal or amendment of such by-laws shall not be enforced or acted upon until the approval of the Minister of Industry has been obtained. The Campbell River Harbour Authority has never been Audited, as per instructions originating from Tim Hobbs during every Annual General Meeting since the Corporation's beginning (1997). CRHA By-Law 65 states; The members shall, at each annual meeting, appoint an auditor who shall audit the accounts of the Corporation for report to the members of the Corporation at the next annual meeting. The auditor shall hold office until the next annual meeting provided that the Directors may fill any casual vacancy in the office of the auditor. The remuneration of the auditor shall be fixed by the Board of Directors. Further, Industry Canada Policy Statement 13.2, states the following; It is important to be aware of the fact that the Canada Corporations Act does not permit a waiver of audit. The Campbell River Harbour Authority, Board of Directors, never presented a CRHA membership List to any CRHA member. Therefore, nullifying any voting practice witnessed during Annual General Meetings, 1997 to 2010. There is no indication that the CRHA Annual General Meeting participants were legitimate CRHA members. Legal information available from this Web Page is limited, originating from Capt. E. Gerardo da Costa Duarte various Private Prosecutions before the Criminal Courts for the Province of British Columbia; to correct the current state of corruption and Judicial decay facing Canada’s Rule of Law. The Canadian Judicial system is in shambles and the Coastal Waters of Canada are plagued with fraud practices that extend to society as a whole. Experiences, before the said Courts of Law, brings forth a shocking truth that the Canadian Judicial System is far from its mandate to protect society from criminal activity. Rather, purposely adapted to protect the criminal interests of corrupt officials of whatever government crime of the day happens to be ongoing. Moreover, past years of criminal investigation uncovering government sponsored criminal activity relating to Harbour Authority fraud practices, involve thousands of document pages involving Transport Canada, Fisheries and Oceans Canada and useless members of the CROWN and the ROYAL Canadian Mounted Police. Capt. E. Gerardo da Costa Duarte attempts at bringing justice to the Canadian shores encountered determined and deliberate perversion of justice originating from the offices of the Attorney General of Canada and the Attorney General of British Columbia supported by twenty two (22) presiding Judges and Justices that purposely breached the Rule of Law to accommodate criminal activity in Canada. For Example, on April 20, 2010, under pressure to hide financial information from taxpayer's, given Capt. 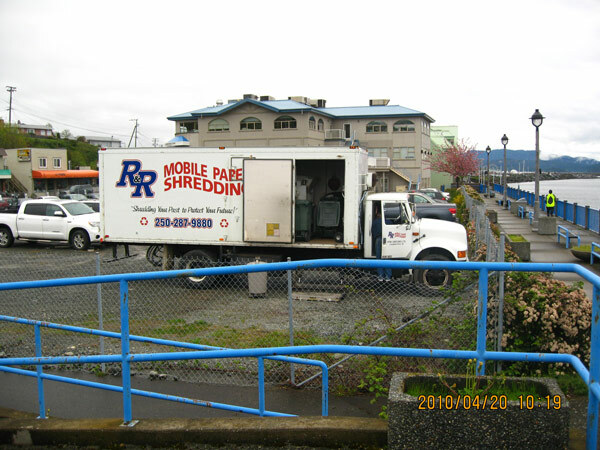 Duarte's persistence to pursue fraud charges against the Campbell River Harbour Authority (CRHA), Board of Directors, a Mobile Paper Shredding Truck, R&R, was seen by various members of the Campbell River community, shredding a large number of document boxes originating from the Campbell River Harbour Authority office located at 705 Island Highway, Campbell River, BC. Supporting the CRHA lack of Audits, since 1997, mandated by law for a Federal registered Not-for-Profit Corporation. Strong evidence supporting FRAUD practices. Canada's national symbol remains the beaver, described by June Callwood in Portrait of Canada as a "slow witted, toothy rodent, known to bite off its own testicles, or to... stand under its own falling trees". Symbolic, Canadians are standing under their own falling tree, biting their own balls when they allow criminals to continue governing our Nation. Canadians must demand a full criminal investigation of Harbour Authorities across Canada. ©copyright, 2016, Captain E. Gerardo da Costa Duarte, all rights reserved.